If you aren't getting the results you want in your online business, maybe it's because you don't respect the effort that things take and you give up to early. We discuss this in detail in today's episode. Darryl: Hi and welcome to “The My Blood Website” podcast where we talk about all things online especially for small and medium business owners and marketers. I'm Darryl King. I've been running my web agency for 25 plus years, my co-hosts Ed Pelgen has been running his online marketing agency for just as long. Our goals; to cover things in a way anyone can understand and can improve how they use online in their business. 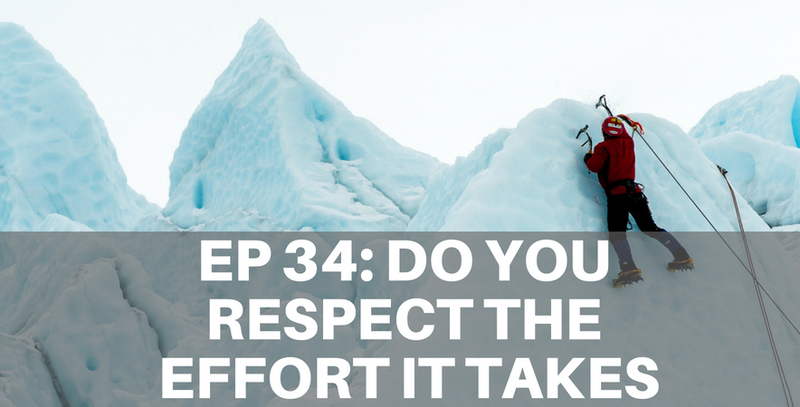 We're about to do Episode 34, it is the 5th of July 2018 and this topic is - Do You Respect the Effort it Takes. How you going Ed? Edmund: I'm going great Darryl. How about yourself mate? Darryl: ok, excellent; so to our US listeners. Yesterday was Independence Day - 4th of July. Happy Independence Day. Like to keep in theme a little bit. You know, when countries go through things like revolutions and independence and all these sorts of things. There's a hell of a lot of effort from a whole hell of a lot of people like is involved to turn events around and that leads to our topic of you know; how much if it does it take to do something well, how much if it does it take to get success and that's kind of where we want to go today. I think. Edmund: So Yeah, I mean; where did this start for you? Why is this topic so close to heart today? Darryl: what about you? Do you get that that experience? Edmund: yeah, what's your saying? What’s your saying? Give us this thing. Darryl: yeah, it's a little bit about; not quite; you know, it's there but it's the same thing you know; to lose weight you have to be consistent and persistent and do it; it'll get fitter you know if you want to lift more weight; whatever it might be; gonna ride along a distance and the same thing is true. If you wanted to do SEO really well yourself. Right? You; there's tactics and there's strategies but before all of that comes knowledge. Isn’t it? Darryl: so the first thing you've got to do is put time into acquiring knowledge and then having acquired the knowledge you might then appreciate how much effort that tactics take right? And so the same thing is true like, I can often hear it. I had a case of someone building software and they had come to me because the project wasn't going great and they had confusion with the development team about what the outcomes they were going to get and things just weren't working the way they want and all of the discussions and deliberations around this were; you know; some mock-ups; very simple that come and done and lots of verbal conversations. There was no overarching document set. Now; for when I looked at it; when I worked there. I looked at two sections of it and I think I came up with nearly 40 or 50 hours of spec work to answer all the questions I would look at you know; because there was some; there was some things that had like four screens but the underlying thing it was doing; was actually really really complex right; like, it was like you know and people don't realize how much effort; they just see the output; oh, look see that beautiful acreage, it's mowed it looks lovely; I want a acreage right? Darryl: that's right; well there is a funny there's a funny (6:36…..? story a ….? little bit) you know what a dragline is, the big dragline to do stuff and so when they're operating you know they; they're working out you know say a cost of $100,000 an hour to run this thing right; and the production that makes is you know; it's producing stuff that turns into a million bucks now, whatever it might be; so when the dragline has a problem the whole thing stops. All these guys are off line, machineries off line it's a big problem; so they fly in the expert; expert will Tim asked some 7 questions walks around it walked up to the side of this big machine and gets out a big wrench and smacks the side of this machine pushed by the whole thing fires up again and then there's this; that; this invoice comes and it's; it's got the two line entry; so, one hitting the machine making it work again you know one hundred fifty-three dollars; well, no I say a hundred dollars and the item 2 knowing where to hit you know nine thousand nine hundred dollars right? And that's the thing right? Edmund: and we driven up and I looked at the guy and I said did you not; I mean; I was shocked because I mean; here's a guy running a multi-million dollar business and here he understands the effort that's required to raise a cow and to get milk out of the damn thing. Did he really think? Darryl: for larger projects so that people get a sense of ah, because you know there are limits to these things but I think it's um; you'd see it even in copywriting Ed? Edmund: so it's being more is it just more insightful considerate thinking about the other person thinking about what's involved? Darryl: so the flip side is; what that you are actually trying to achieve that this that that you need this thing for; whether you're doing it yourself or you're engaging someone else to do it; how important is it; so then that helps to create a value equation; right? so if you're selling if you sell hundred thousand dollar machines right you know whatever; and you want to sell two more of them a month; it doesn't sound like a lot to more sales to more leads a month that convert so that might mean you get ten leads from your web properties a month then you can do it you know one in; it's like two and ten how much effort would you do if you had someone running around cold calling and doing it you know full-time guy or girl might be doing that work and you pay all this money and I'm not trying to equate money but as an expectation as a sales manager or anything you would go they're gonna do this many calls and you break it down and formulas and they're basically working twenty five thirty hours a week on reaching out and networking, sending proposals and doing all the stuff; so a lot of effort; right? Edmund: What do you reckon Daryl? Edmund: that's right; you reckon we're done per day? Edmund: awesome, well that's it today; Thanks again for listening. This is a real good episode. I enjoyed this one. They’re quite entertaining. Thank you for listening, we really appreciate having you along for this ride. If you want to see the show notes get access to our resources we talked about, get notified when the next episode goes live. Visit bloodywebsite.com or subscribe to the podcast on apple podcast or stitcher, also if you enjoyed this podcast please leave a review in Apple podcast. It really helps wonderful people discover this podcast and learn more. We hope to see you next week where we're gonna continue the chat about my bloody website. It’s goodbye from me.